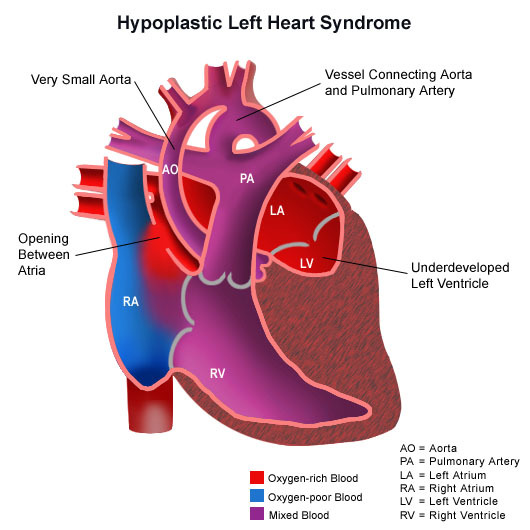 What is Hypoplastic Left Heart Syndrome? | Half Heart. Whole Life. Hypoplastic Left Heart Syndrome (also known as HLHS), is a rare congenital heart defect in which the left side of the heart is severely underdeveloped. In babies with HLHS, the aorta and left ventricle are very small, and the aortic and mitral valves are either too small to allow sufficient blood flow or are atretic (closed) altogether. As blood returns from the lungs to the left atrium, it must pass through an atrial septal defect to the right side of the heart. In a healthy human, the left side of the heart receives oxygen-rich blood from the lungs and pumps it out to the rest of the body; with these structures underdeveloped, they cannot circulate blood to other organs, and the right ventricle must pump blood to both the lungs, as it would normally, and to the rest of the body, a situation which cannot be sustained for long. In cases of HLHS, the right side of the heart often must pump blood to the body through a patent ductus arteriosus. As the ductus arteriosus closes a few days after birth, blood flow is severely restricted and eventually cut off, leading to dangerously low circulation and eventually to shock. Without treatment, HLHS is fatal, but with intervention within a few days after birth, an infant may survive. A pediatric cardiac surgeon may perform a series of operations or a full heart transplant. In the meantime, the ductus may be kept open to allow blood flow using medication containing prostaglandin. Because these operations are complex and need to be individualized for each patient, a cardiologist must assess all medical and surgical options on a case-by-case basis. The two methods for treatment of HLHS are transplantation and surgical correction. If corrective surgery is performed instead of a transplant, it may involve the 3-step Norwood procedure. In the first step (switching the right ventricle in functional position of the absent left ventricle) it allows the right ventricle to continue to pump blood to the whole body, followed by the next two steps (which are nearly identical with the Fontan procedure) to connect the veins which return blood to the heart and pulmonary artery. The Norwood procedure is generally performed within a week of birth, with the next two steps generally being performed within the first two years of life. While infants successfully treated for HLHS have a good chance of survival, they may experience chronic health problems for the rest of their lives. HLHS patients run a high risk of endocarditis, and must be monitored by a cardiologist for the rest of their lives to check on their heart function. Posted on October 12, 2013, in awareness and tagged CHD, congenital heart defect, HLHS, hypoplastic left heart syndrome. Bookmark the permalink. Leave a comment.